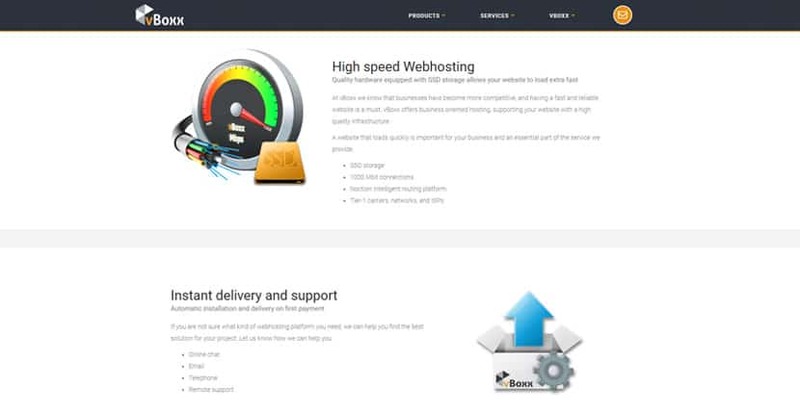 vBoxx Review 2019: Is vBoxx a Good Hosting? vBoxx is an excellent website hosting company based in the Netherlands. They offer a full suite of website hosting services, great customer service, and a competitive price point. vBoxx is a website hosting provider based in the Netherlands. They’re relatively new to the industry given that they were founded in 2012, but they currently serve customers in over 25 countries around the world. They provide shared hosting, VPS hosting, dedicated servers, and Mac hosting. They also offer email services, backup options, cloud storage, domain name registration, and SSL certificates. vBoxx offers their customers three basic shared hosting packages that largely have the same standard features. Where they differ is in the amount of storage, data traffic, and MySQL databases provided. What I found reassuring about vBoxx is the fact that all of their servers are housed internally; they don’t outsource or resell hosting from other companies. They operate out of two Tier III data centers in the Netherlands. However, it’s important to note that these data centers are not their own; they partner with another data center operator, but they own and conduct exclusive maintenance on their own hardware. vBoxx seems to contradict themselves in their performance guarantees. While they advertise a 99.99% uptime guarantee on the homepage of their website, there doesn’t seem to be a detailed refund policy written anywhere else to back up this claim. The closest thing I could find was an SLA which guarantees 98.75% uptime — 99.5% if you pay a hefty monthly fee for the best SLA — but this falls very far short of the industry standard. vBoxx’s prices are comparable to other providers in Europe and larger international hosting providers. They also offer a lot of flexibility to build a plan which suits your needs and budget. The caveat is that none of their shared hosting plans include a free domain registration, so you’ll have to pay for that fee on top of your web hosting package. For standard website hosting, vBoxx only offers an annual price. They don’t offer a discount when you purchase for longer terms, nor do they offer the flexibility of monthly pricing. However, after chatting with support, they did offer me an All-In-One package on a monthly plan, which includes email, cloud storage, and website hosting. vBoxx doesn’t offer any free trials, free hosting plan, or money back guarantees. The year-long contract plus the lack of a trial period is a little disappointing as it seems like a big commitment — especially when you consider that they’re fairly new to the industry and don’t have the reputation to back up their claims. That said, it’s possible to upgrade or downgrade at any time, which is a nice option. In terms of customer service, I was really impressed. They’re available 24/7 via live chat. I’ve contacted them several times and always received a response within seconds. They answer professionally, yet not with canned responses. They also have email and phone support, but live chat has been so helpful that I’ve never needed to call or email. Live chat is available in both English and Dutch. vBoxx is a full-service website hosting company based in the Netherlands. Their website, their support, and their packages are all extremely professional. However, it’s important to bear in mind that domain registration is not included in their website hosting packages and their uptime SLA is a little contradictory. Wondering how vBoxx stacks up against other Web Hosting companies? Enter any other Web Hosting company and we will give you a side-by-side comparison.